This product is the Nintendo Switch version of the legendary Smash Bros. Characters from Nintendo and the world of video games come together in this fighting game where fun and laughter are guaranteed. It continues to maintain the bases of its previous deliveries, but with a significant qualitative leap in terms of its graphic aspect. Mario, Luitgi, Metroid, Kirby, Megaman, and dozens of other characters will fight back in one of the funniest fighting games ever developed for consoles. Attention: This product may be available in a physical version, so you will receive the game at home after purchase, or in a digital version. The digital versions can be a Nintendo eShop code, which we will need to redeem on the Nintendo website. Or in account format, with which we will receive a username and password to log into an account that already has the game. Both Nintendo eShop codes and accounts can be regionally blocked, so we recommend that you read the information in each of the stores carefully. 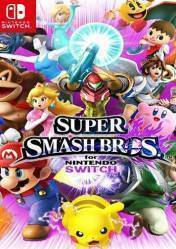 There are no comments yet about SUPER SMASH BROS. You can be the first one!